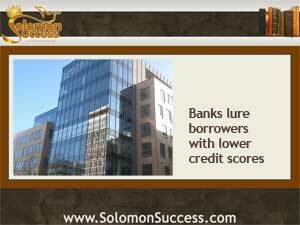 Solomon Success > Blog > Will Lower Credit Standards Boost Borrowing? Will Lower Credit Standards Boost Borrowing? That’s sound advice for buying real estate, where a property bought now under currently low interest rates creates conditions for a return for years to come. But tighter lending standards have kept mortgage applications at new lows – and lenders are flexing credit score standards in an attempt to reverse the trend. We’ve reported previously about the ongoing saga of mortgage lending reform in the wake of the housing collapse of a few years ago – a crash that stemmed in large part from the wholesale granting of mortgages to unqualified homebuyers who then lost their houses in spectacular fashion. That led to the much-publicized investigations into widespread fraud and illegal practices on the part of the nations big banks – and the eventual passing of the Dodd Frank Act that aimed to protect borrowers from predatory lending practices – and themselves. The latest piece of protection to take effect was the Qualified Mortgage Rule in January 2014, which established tighter criteria for mortgage applicants and legal protections for lenders that followed them. But those good intentions had the unintended effect of slowing mortgage applications. Those tighter lending standards mandated larger down payments, higher credit scores and a lower debt to income ratio for most buyers – all measures to make it more likely that borrowers could carry the loan without defaulting. Those standards ended up locking out a lot of potential purchasers with lower than optima credit scores or too much debt to suit. With interest rates staying low and housing prices going up, lenders began making adjustments to attract a wider range of potential borrowers. The tinkering centered on lowering down payment requirements and adjusting credit score thresholds downward. In 2013 the minimum acceptable credit score for a new mortgage underwritten by private loan providers had been 761; by spring 2014 it had dropped to 755. And for federal mortgage services such as the FHA, scores dropped even lower – from 696 to 684. But won’t lowering the credit requirements open the door to more iffy borrowers who will fall into default? And doesn’t that make the Qualified Mortgage Rule irrelevant? Not necessarily, say lenders and housing industry observers. Even though the QMR took effect in January, borrowers have always been able to offer any loan products they choose – but by stepping outside the bounds of the QRM, they lose the protection from prosecution over bad loans that it provides. And since mortgage borrowing overall has dropped, loosening credit score requirements could boost the numbers – and lenders’ revenue. What’s more, it’s not just demand for new loans that has fallen – refinancing applications have taken a nosedive across the industry. That means lenders have to find ways to make loan products available to more potential borrowers and encourage more activity in the housing market.